Some of you might remember one of my old posts where I claimed to "Begin eating healthy"! This post belongs to the same category - right at this point, you should totally forget that I prepared two types of black forest cakes, kesari and payasam and other stuff in between that post and this! LOL! Anyways - this is something my sister did recently and told me how good it was. So, it her's idea! Not mine! I've been eating chappathis everyday for lunch and my daughter loves it too. Both our lunches are chappathis and sabji or daal most of the time. That by itself is healthy compared to rice - wheat has a little more fiber than rice and besides I'm definitely not a rice person. But, I wanted to add a little more fiber and protein to what I eat. Being vegetarian, that is always a challenge, at least the protein part. So, this powerhouse atta is a combination of 5 wonderful high fiber and high protein flours! Mix it all up and store it that way - make fresh chappathis out of this atta instead of just plain atta. Simple. Right. 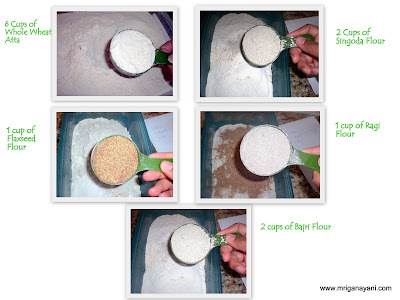 Now, you are free to add any flours that you like to do this. I just went to the Indian store and picked up the packets and read the nutritional info on those. I knew I had to add flaxseed and Ragi. 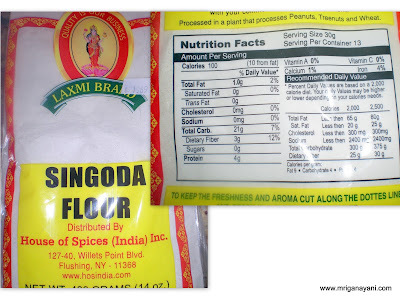 The Bajri and Singoda flours were new to me but I was pleased with what I saw in the food label. So, picked up those too. The propotion to mix these is also entirely upto you. But, if you want to make softs chappathis, always have a little more of the atta. Anyway you do it, there is always a benefit of adding the higher fiber foods. To make it easy, I've added pictures of the food labels for all except Raagi. The Manna packet did not have the label at the back. But, we all know how nutritious Ragi is! I'll add the label if I come across it during my next visit. All nutritious info are based on a serving size of 1/4 cup. Known as Alsi in Hindi, Ali Vidai in Tamil, Avise Ginzalu in Telugu, Jawas in Marathi, Agasi in Kannada, Avise ginzalu in Telugu, and Cheruchana vithu in Malayalam. Benefits: Its high content of alpha linolenic acids has made the ancient flax seed become our modern miracle food. Alpha linolenic acid is a type of plant-derived omega 3 fatty acid, similar to those found in fish such as salmon. Benefits of flax seed as shown in many studies include lowering total cholesterol and LDL cholesterol (the Bad cholesterol) levels. 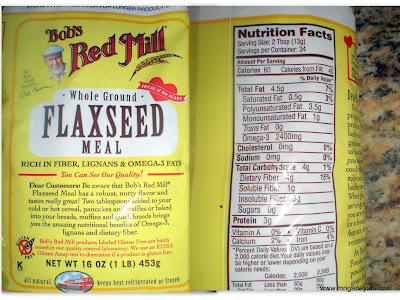 Other benefits show that flax seed may also help lower blood triglyceride and blood pressure. It may also keep platelets from becoming sticky therefore reducing the risk of a heart attack. Buckwheat is high in fiber. Buckwheat contains the eight essential amino acids. Buckwheat contains many minerals including: phosphorus, magnesium, iron, zinc, copper and manganese . It contains a rich supply of flavonoids, particularly rutin. Buckwheat lowers glucose levels and is beneficial for managing diabetes. It is also found to lower blood pressure and reduce cholesterol. This fruit seed and is a gluten-free alternative to grains. I'll try to get the nutritional info for this - don't have it currently. 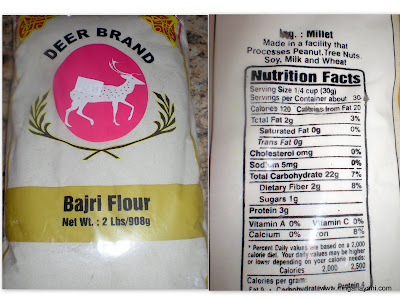 Ragi is low in carbs and high in Protein. A must diet for Diabetics as it controls the blood glucose level very well. High in Antioxidants. Helps in building strong muscles. I took a big storage container and mixed these in the following proportion. You can vary the amounts to suit your taste. But this proportion does give soft chappathis that fluff up on the flame. Mix it all up well until completely combined. Store it in a big container for future use just like you would store chappthi atta. To try chappathis, I took about 1 cup of the mix and added salt and kneaded into a ball. Make chappathis out of it. Fry it on a tawa on both sides at high heat. I moved it straight to the flame from the tawa. You can see how it puffs up like regular chappathis. Make sure you do this so that the heavier grains are cooked well. There they are. I can pinkie swear that there was no difference in the taste. I ate it hot right from the stove and it was great! And I was happy that I was eating a sensible healthy meal! Here's my plate with some Onion tomato sabji. Enjoy! Peace Out! Eat Healthy and Be Happy! Thanks for sharing such a lovely recipe. I have few of these attas at home so would love to mix and use! That's a great idea...very informative post. My fav roti... looks yummyyy... wonderful job!! Wow that seriously healthy and powerpacked one, my mom would love to give this a try! That is such a healthy and nutritious blend of attas. Will definitely make my mix and try these out very soon. Thanks for the wonderful post. Such a healthy and nutrtious chappathis..
Looks too healthy and delicious! wow1 U have such an interesting and informative yet lovely blog!!! The powerhouse chappatis look nice and fluffy and imagine how healthy it is!!!!!! I liked your blog very much. I appreciate for the wonderful presentation. Chappati looks nice and fluffy and everyday I eat chappati as I love to eat. That'sd just a wonderful idea, Mrigs! I'm going to use this idea, as soon as I can. I have tried just by adding few flours... this is a good version... never used buckwheat flour ... will try to get them soon and try..
Hey I tried this healthy chappathi yesterday dear .. It was so tasty. Just wanted to let u know immediately but occupied with some works. We grind all the fresh flours & spices, you can visit us at www.chandrikamasala.com. We have Healthy Atta that doesn't have wheat and Aarogya Atta that has wheat and nine nutrition grains. Please give a look. Re the chapattis...I will surely try your recipe. I must add at this point in time that I have tried other variations like adding ground oats, soy flour and flaxseed meal to my atta. It really turns out yumm and healthy. And like you mentioned, adding wheat flour in a larger proportion than other flours will make the chapattis soft. thanks for this tip. I recently visited a store in Houston, TX. They grind fresh all the flours. I saw they had mixed flours like you had mentioned but I don't know the proportion. You can check out their website- Chandrika Masala. Prices were reasonable to me. Singoda or singada atta is made from water chestnut. Buckwheat is a grain neither get this cereal nor grass but a pseudocereal. It is known as kuttu in hindi.I like the recipe and I get all mixed with what is the english translation of Indian food stuffs too. As a foreigner in India your explanations of the different flours were so helpful! Thank you for defining everything so clearly.